Home / Media Centre / Mouth breathing in infants, toddlers, pre-schoolers and primary school children… Is it a concern? Mouth breathing has until quite recently not been regarded as a serious problem. However, the current understanding is that it can be quite a significant issue, depending on the age of the child and the reasons behind it. In fact, chronic mouth breathing in a young child can have a major impact on the facial skeletal development as well as intellectual, behavioural and social development. Nose breathing is far healthier than mouth breathing because nose breathing allows the most important function of the natural production of nitric oxide, one of the vital respiratory gases. The antral sinuses are the source of formation of nitric oxide, and mouth breathers bypass this vital function. What does nitric oxide do and why do we need it? Nitric Oxide is mixed with the air we breathe in, and it works on the lining of the lungs to dilate the lung capillaries which increases the absorption of oxygen and excretion of carbon dioxide, helping to facilitate better circulation through the body. Our brains only function fully when we have adequate oxygen levels and a reduced oxygen carriage to the tissues causes a reduction in efficiency of every cell in our bodies. Our young facial skeleton develops very much around this correct nose breathing function and if it does not occur, the face develops in completely different ways which can result in severe teeth malocclusions, un-aesthetic facial appearance, impaired intellectual development and behavioural problems often mistaken for ADHD. Both mouth breathing and snoring are likely indicators of Sleep Disordered Breathing, a childhood pre-cursor to a life of Obstructive Sleep Apnoea (OSA). OSA is a condition with severe, if not life-threatening health risks including higher risk of heart attack and stroke, elevated blood pressure, diabetes, obesity, dementia and Alzheimer’s and depression, amongst others. The most common causes in young children are enlarged tonsils and adenoids, allergies like hay-fever (allergic rhinitis) and hereditary jaw size discrepancies. 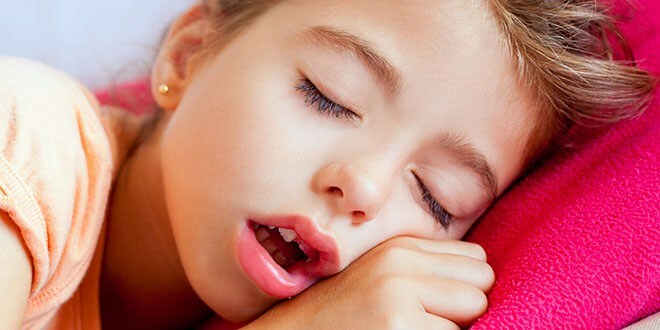 One of the common indicators of mouth breathing in a young child is snoring. This was not taken seriously until quite recently and many GP doctors still tend to ignore it. It is a serious concern if it continues and should be thoroughly investigated. Future Dental will be able to look at the tonsils to determine if they are the likely cause snoring. Only the ENT Surgeon can give a good opinion about the adenoids as they are only visible on either x-rays, or by nasal endoscopic examination. Some GP doctors can offer that service, but unfortunately the significance of mouth breathing in young children is not broadly enough recognised amongst the medical profession as yet to be certain your doctor will be switched on to it. We can refer your child directly to our ENT Surgeons for assessment as to whether removal of tonsils and adenoids will make a big difference. Current research indicates that proper treatment of childhood snoring and mouth breathing can make a huge change in reducing facial and facial skeletal developmental problems while often eliminating what was previously diagnosed at ADHD and improving educational outcomes. Appropriately timed adeno-tonsillectomy (removal of adenoids and tonsils) can often prevent the high cost, embarrassment and inconvenience of later major orthodontic correction and even orthognathic surgery. If you are concerned about your child’s mouth breathing or snoring, Future Dental in Cairns can help you determine the cause, and minimise the side effects. For more information, or to book a consultation, please contact us today.